We all don’t have the time to find a game and slow play our poker hands, gradually building our chip stack over the course of a few hours. 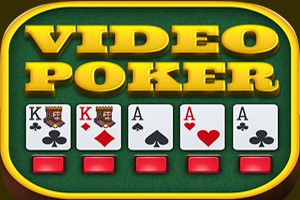 Video poker is great for players of any tempo, but when you’re looking for quick poker action, be it for killing time before watching the game or just enjoying some gambling action. Once you get a hand on the style and payouts of your video poker game of choice, you can set your own tempo. Most poker table games require a few people to make it interesting. Draw and Hold’Em poker require some organizing and waiting until tables fill up and variations like Pai Gow and Three-Card poker involve a dealer as well as other casino patrons. Video poker, on the other hand, is a solitary game where you don’t have to worry about the guy sitting across from you. It’s you against the odds, and that’s often what players seek out when playing video poker. Video poker may not have the glitz and glamour of other casino games but it’s one of the smartest bets in the casino. Depending on the odds and payouts, video poker holds a house edge between 0.5 to 5 percent. That ranks among the best games for bettors on the entire casino floor. And you also don’t have to be a crafty poker pro or a human calculator to get that advantage. Beginners have just as much of a chance of scoring a big win as seasoned veterans. Depending on the game and the crowd you run with, standard table poker action can take forever to build a sizable win. Players with a more conservative style of wagering may find that it just isn’t worth the wait, which is why video poker is a tremendous option for those looking for some big bonuses. Hitting some of the higher-ranked poker hands can payout 25/1, 50/1 and even 800/1 – if you score a Royal Flush. Even if you pulled the great white whale of poker hands in a game of draw, you only get back what is being bet.